Holidays are here! Mix things up by blending up an eggnog smoothie. Okay... maybe you love eggnog... maybe you hate it. I had to include it on the Christmas Smoothie List. I also created a healthier vegan eggnog-less smoothie. 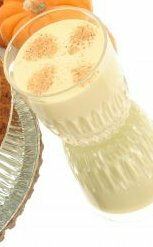 I sure hope you enjoy these eggnog drinks just as much as I did! Blend all of the ingredients until smooth. Delicious! Blend the first three ingredients until smooth. Then add the rest of the ingredients and blend again.